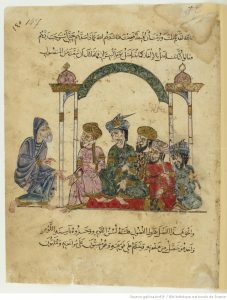 The Workshop on History of Arabic Logic has two main aims: to make better known the richness and importance of Arabic logic, that is, logic developed and studied in Arabic-speaking lands from the 8th to the 15th centuries CE; and to provide a forum for interaction and discussion by scholars of Arabic logic. Since the last century, scholars have acknowledged the original and relevant contribution of medieval Arabic philosophers and thinkers to the development of medieval Western logic and, more generally, to the history of logic. Registration: Registration is now open at University of St Andrews Online Payment Services. Registration closes on 29 April 2019. Childcare: through the generosity of the British Society for the History of Philosophy, in order to encourage demographic diversity, we are able to offer financial assistance with childcare during the Workshop. Please email Dr Barbara Bartocci with details of the childcare needed. We are grateful to the University of St Andrews, via the Arché Research Centre, to the British Logic Colloquium, to the British Society for the History of Philosophy and to the Scots Philosophical Association for financial support.